The Chief Executive Officer of Sri Lanka’s cash-strapped national carrier Capt. Suren Ratwatte says that addressing four major issues would help SriLankan Airlines return to financial health. 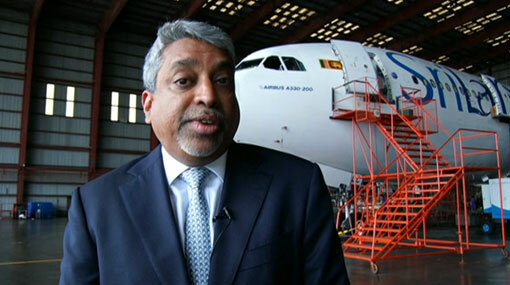 In an exclusive interview with Ada Derana 24X7, he said that the airline is actually profitable at an operating level. According to the SriLankan Airlines CEO, the second biggest problem is the high fuel price in Colombo. He stated that Colombo unfortunately does not price its fuel at market levels and this forces the airline to buy its fuel externally which is a loss of income to CPC and the country and also drives their cost up. The third problem, he said, is a high cost of aircraft leases that were part of a very ambitious expansion program entered into in the last four to five years. “Unfortunately the markets have changed considerably since then and the revenues can’t support those high lease cost,” he said. “Once we address these four issues and we have submitted detailed plans on all of these to the shareholder, we can return the airline group to financial health. Of that I am completely convinced,” Ratwatte said. Responding to a question regarding the national carrier’s move to stop flights to European destinations, the CEO said that it was done based on two reasons. He stated that one reason is that these routes are actually almost entirely dependent on leisure traffic and the Middle East carriers have been aggressively pushing down the prices on those routes, which saw a halving of the ticket prices over the last four years. He said that the routes are no longer financially viable for the airline to operate. Capt. Suren Ratwatte also said that during the airline’s decade-long partnership with Emirates, the national carrier was able to turn a profit because management control was with the executives. “And before any partner comes in I’m sure the partners themselves are aware of this fact they would make absolutely sure that they had sufficient equity and sufficient levels of oversight where they could run the company as a private enterprise corporate governance demands,” he said. Inquired regarding his opinion on making the whole processes efficient at the airline, the CEO said that he firmly believes that putting the board of directors in charge of decision making would help a long way. “If we have to seek higher approvals further up the tree because of our shareholding it changes the entire structure and it makes it very difficult to run a commercial company. Then we become something else,” Ratwatte said.